Aldi reveals an all-in-one turntable for just £30 | What Hi-Fi? Yesterday we reported that Lidl had started selling its own turntable for £50. Now arch-rival Aldi has been in touch with What Hi-Fi? to say that it too will be getting in on the action. A 'limited edition suitcase turntable' is on the way - and it's set to cost just £30. The Aldi turntable will play records straight out of the box, thanks to built-in speakers and a USB connection for ripping your vinyl - just like its Lidl counterpart. 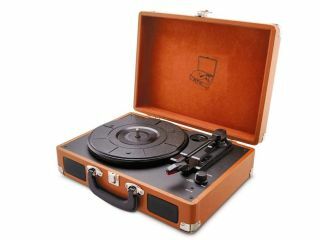 The suitcase design does at least set it apart from the Lidl turntable, albeit not from many of the other all-in-one turntables on the market (*cough* Crosley *cough*). Supposedly designed for "music-mad friends and family", the player can handle records at 33, 45, and 78rpm. Although Aldi claims that, "as with all Aldi Specialbuys, once they’re gone, they’re gone", an exceedingly similar-looking turntable appears to have been sold on Aldi's website earlier in the year. Regardless, this Aldi turntable will be available to pre-order online from the 17th November and in stores from 24th November, just in time for Black Friday (though we'd assume it can't get much cheaper). So it looks like the high street is betting on cheap turntables being a big-seller this Christmas. Perhaps not surprising now that Sainsbury's is the biggest high street vinyl retailer in the UK. With all that said, might we suggest you check out our pick of the best budget turntables, with record players from just over £100. Unlike a lot of cheap turntables, they deliver great sound and won't damage your records.